Ideal for factories, distribution centers, and warehouses. Pallets are among the most vital pieces of material handling equipment used in modern commercial and industrial settings. They are absolutely essential to the optimum functioning of many factories, distribution centers, and warehouses. In fact, in any large, open-air workplace where large amounts of goods need to be stored as well as transported from one area to another, you are likely to find a high number of pallets in use. 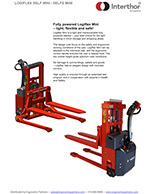 There is a wide variety of pallet handling equipment available today to enable businesses to make optimum use of pallets, especially in the areas of lifting and transporting them. 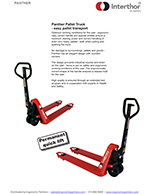 The manual and battery powered pallet jacks and lifts below are a few of the solutions that Ergonomic Partners offers. 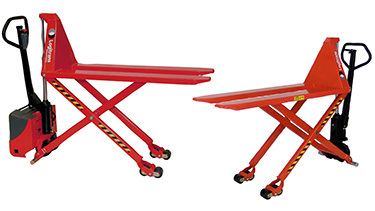 Can be used with standard GMA pallets, 48 inch x 40 inch CHEP pallets and/or skids. 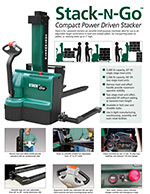 Handles and steers like a standard pallet jack. 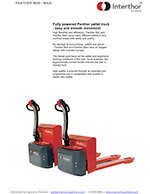 Dual-purpose electric pallet jack product allows for both transport and load positioning. 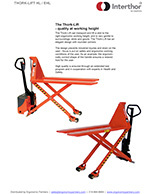 Lifting fork height up to 36 inch | Lift capacity of 2,000 pounds (see chart below). On board, automatic battery charger | Efficient 24 VDC battery system powers lift operation. Electronic operator console with "Raise” and "Lower" push buttons, dual function key/battery disconnect switch, outrigger position LEDs, charger status LED and battery condition LED. 8 inch diameter polyurethane steering wheels | 3 inch diameter polyurethane load wheels. UNI-20 2,000 lbs. 2,000 lbs. 1,700 lbs. Panther Maxi and Panther Mini offer high performance, high flexibility and efficiency that prevents industrial injuries and strains for workers. Powered Models Include: AC-technology (Curtis Controller). Low use of power, Long operation time per charge. Easy to drive, accelerate and decelerate speed control. BF 2500 (ETT) 5,500 lbs. 20.5" or 27" 48"
Panther 1672/1682 3,520 lbs. 18" 32"- 45"
Panther 2572/2582 5,500 lbs. 20.5" or 27" 32" - 79"
Panther 3072/3082 6,600 lbs. 20.5" or 27" 32" - 48"
Panther Silent 2082 4,400 lbs. 20.5" or 27" 32" - 48"
Panther Inox Plus (Stainless) 5,500 lbs. 20.5" or 27" 32" - 48"
Panther Mini 3,100 lbs. 20.5" or 27" 32"- 60"
Panther Maxi 4,000 lbs. 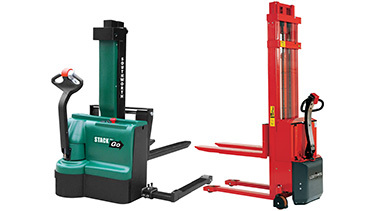 20.5" or 27" 32" - 60"
Southworth Stack-n-Go's are ideal machines for a transporting items on pallets. 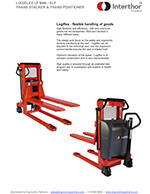 Stack-n-Go electric pallet jacks can stack loads up to 7 feet high or can be used as an adjustable height workstation for loading and unloading pallets. All feature a narrow 62 inch mast (lowered height) and offset handle to give operators a clear view of what is in front of them. Forward and reverse drive controls are located on either side of the the steering handle and an auto-reversing belly switch, protects workers when walking backwards with the unit. Choose a Fork-Over unit for use with open bottom pallets or skids, or a Straddle unit for use with any pallet or skid, even closed bottom. FPS3000-43 NFO (Fork Over) 3,000 lbs. 43" 21" or 27"
FPS3000-43 NAS (Straddle) 3,000 lbs. 43" 12.5" - 27"
FPS2500-90 NAS (Straddle) 2,500 lbs. 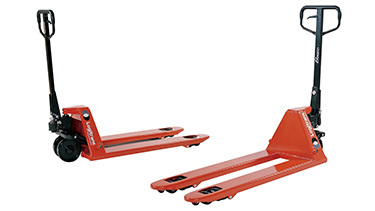 90" 12.5" - 27"
Trans-Stackers/Positioners are ideal for picking or placing loads in racks or mezzanines, or unloading trailers from grade level. 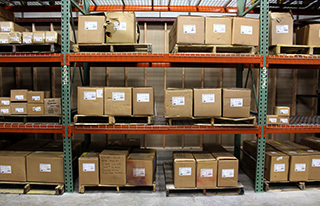 Use fork-over for open bottom skids or pallets and/or straddle for any type of pallet or skid. 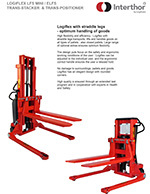 Features Include: Lifting Heights to 130 inches, Manual or Electric, Narrow Aisle Maneuverability, Fork Over or Straddle for Any Type of Skid or Pallet. LF MINI 1002 (Manual Lift/Push) 2,200 lbs. 22" 45" 36" or 65"
ELF 1001 (Electric Lift Only) 2,200 lbs. 22" 45" 36" - 130"
SELF MINI 1002 (Fully Powered) 2,200 lbs. 22" 45" 36" or 65"
SELF MAXI 1002 (Fully Powered) 2,200 lbs. 22" 45" 36" - 130"
ELF 1201 (Electric Lift Only) 3,000 lbs. 22" 45" 36" - 63"
SELF MAXI 1202 (Fully Powered) 3,000 lbs. 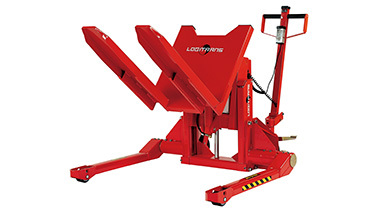 22" 45" 36" - 63"
LFS MINI 1002 (Manual Lift/Push) 2,200 lbs. Adj. 42" 35" or 62"
ELFS 1001 (Electric Lift Only) 2,200 lbs. Adj. 42" 35" - 128"
SELFS MINI 1002 (Fully Powered) 2,200 lbs. Adj. 42" 35" or 64"
SELFS MAXI 1002 (Fully Powered) 2,200 lbs. Adj. 42" 35" - 128"
ELFS 1201 (Electric Lift Only) 3,000 lbs. Adj. 42" 35" - 62"
SELFS MAXI 1202 (Fully Powered) 3,000 lbs. Adj. 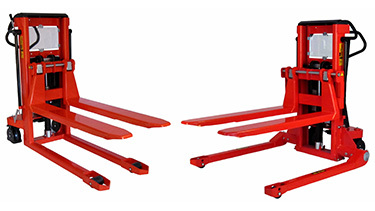 42" 35" - 62"
*Straddle Sizes: A: 33" - 37", B: 37" - 44", C: 44" - 51"
Ergo-Tilts are ideal for machine feeding and offloading or any applications that involve working with parts in containers, wire baskets, or totes. LT 1001 TE (Fork Over) 2,200 lbs. 22" or 27" 31.5"
LT 751 TE (Fork Over) 1,650 lbs. 22" or 27" 45"
LT 1001 TES* (Straddle) 2,200 lbs. 22" or 27" 31.5"
LT 1001 TES* (Straddle) 1,650 lbs. 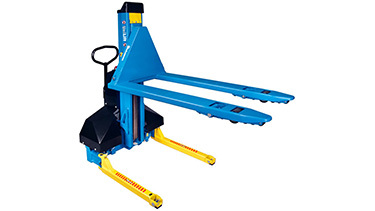 22" or 27" 45"
Thork-Lifts are ideal for machine feeding and offloading, load unitizing/palletizing, transporting loads to and from assembly and staging areas or as adjustable height workstations. Features Include: Lifts loads to 31.5 inches, Lowers to 3.5 inches, Patented stabilizers prevent movement when raised, Manual or Electric lift. HL 1006 (Manual) 3,300 lbs. 19", 21.25, 27" 47"
EHL 1004 (Electric) 3,300 lbs. 19", 21.25, 27" 47"
Don't see what you need? 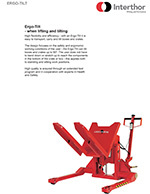 Contact the professionals at Ergonomic Partners for assistance with your special handling applications. 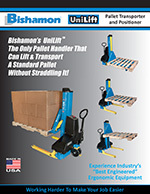 Ergonomic Partners provides pallet lifts and other services; serving clients from coast to coast, Canada, Mexico and especially focused in the states of Missouri, Illinois, Indiana, Kansas, Arkansas, Mississippi, Nebraska, Tennessee, Kentucky, Iowa, and Oklahoma.